I think of the antioxidants found in tomatoes to be little warriors in the fight against cancer. Specifically cancers like colon, prostate, breast, endometrial, lung and pancreatic tumors. Tomatoes are rich in Lycopene, which is a flavonoid antioxidant - a unique phytochemical present in tomatoes. (Basically, phytochemical means the healthy compound found in plant-based foods.) The red tomatoes have a high concentrate of this antioxidant. It can protect your cells in the body from harmful oxygen-free radicals (which is why it's such a good warrior to have fight against cancer). This lovely red vegetable/fruit also contains very good levels of Vitamin A, a & b carotenes, xanthins and lutein. Together these pigment compounds have antioxidant properties and help maintain healthy vision, skin and bones. So basically . 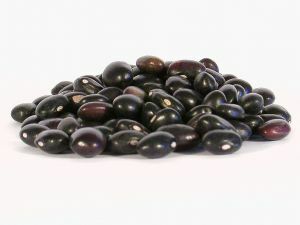 . . it's a superfood and another wonderful gift from the Mayans (but I'm not going to give you a history lesson now, I'll save that for another time. 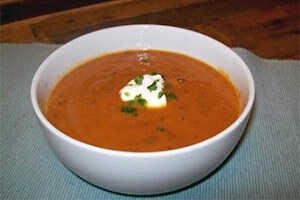 Right now, I'm just going to share my soup recipe with you.). Sauté chopped carrots, celery, onion, rosemary and thyme in approximately a tablespoon of olive oil. Add salt, pepper and chipotle pepper powder. Cook for 5-7 minutes until veggies are tender and onions are soft. Add box of strained tomatoes and the teaspoon of sugar. Rinse out the box with equal amount of vegetable stock, add to pot. Stir and let bubble away for about 10 minutes until veggies are completely tender. Taste and adjust seasoning at this point. Lower heat and use either an immersion blender or transfer soup to blender and blend until soup has smooth consistency. If using a blender, blend in batches using caution as hot liquid may splash when blending. After blending, return soup to pot, add frozen spinach and warm through on low heat. Add splash of balsamic vinegar before serving. Mix yogurt, lemon zest and salt & Pepper to taste. 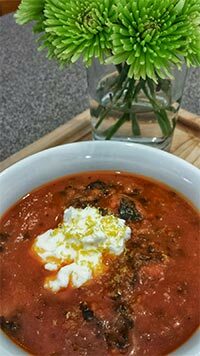 Ladle soup into bowls, dollop with yogurt mixture and serve with warm toasty bread. Fall is upon us and for many of you you're already feeling the weather change to cool and crisp. The leaves are starting to concentrate their sugars, turn colors and eventually dry out. 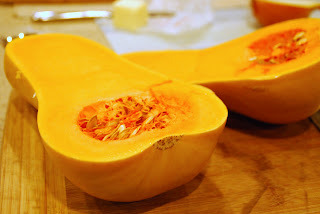 Well, I just found out another cool reason to eat butternut squash that helps your skin stay smooth and not dry out . . . keeping us younger and younger looking! Vitamin A was the first vitamin to be discovered in the early 1900s. Vitamin A is part of a large family called retinoids. This is because Vitamin A is primarily needed by the retina (the part of the eye that lets you see light). But vitamin A does more than just “feed” your retinas. The main form of Vitamin A from plant sources is carotenoids. There are over 600 carotenoids but the main ones are Beta Carotene and Alpha Carotene. Beta carotene basically looks like 2 Vitamin A molecules combined. 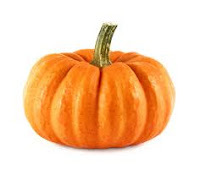 Beta carotene is what gives fruits and vegetables their yellow and orange color. 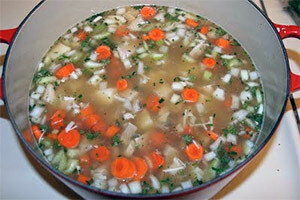 For me, knowing how good the nutritional values are for me only makes this great tasting soup taste better . . . enjoy! Sautee onion, carrot, celery, sage, rosemary in olive oil until soft and starts to caramelize. 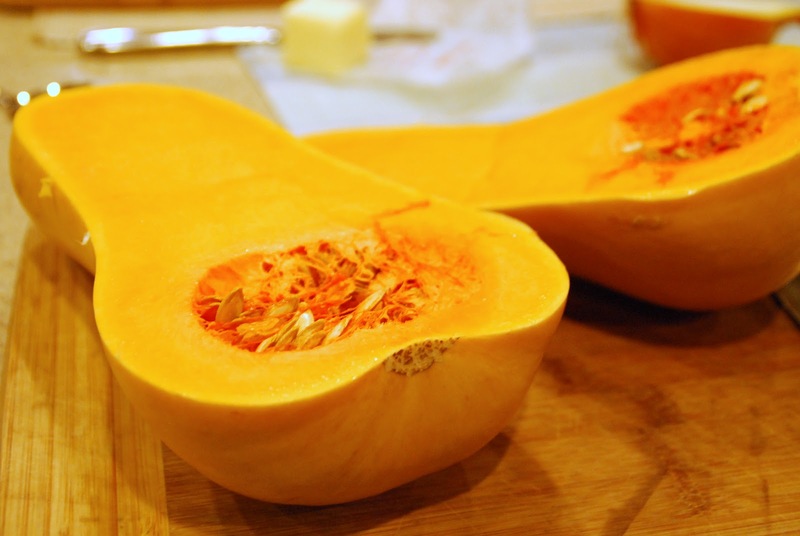 Add squash and maple syrup – use hand blender or food processor and blend until smooth and mixed through. **Add finely chopped apple (1/4 cup) to sautéed onion, celery, etc. for a sweeter taste and crunch in soup.